Jones repeatedly peddled the conspiracy theory that the 2012 mass shooting in Connecticut was a “staged” hoax and that the families are paid so-called “crisis actors." A judge allowed a defamation suit brought by the parents of a Sandy Hook mass shooting victim to go forward on Thursday after conspiracy theorist and radio host Alex Jones sought to dismiss the suit. The judge ruled that the suit filed by Veronique De La Rosa and Leonard Pozner, the parents of 6-year-old Noah Pozner, against Jones and his website Infowars could proceed after hearing arguments at the beginning of August to have it dismissed. Judge Scott Jenkins of the 53rd District Court in Austin, Texas, also ruled that the parents could have access to four depositions, including one with Jones. On Friday, that same judge also ruled that Jones and InfoWars personality Owen Shroyer must give sworn testimony in depositions no later than October 22 in a suit filed by Neil Heslin, the father of 6-year-old victim Jesse Lewis. The judge ordered that each deposition should last no more than two and a half hours. They are also expected to get written discoveries from Jones and Shroyer, which must be answered in the next 30 days. Heslin and the parents of victim Noah Pozner filed defamation suits in April in Texas, where Infowars is based, accusing Jones of leading them to be harassed, tormented and subjected to death threats from his followers because of his false claims. The suits are seeking more than $1 million in damages. Infowars host Owen Shroyer is also named in Heslin's suit over a video last year in which he said it was "not possible" for Heslin to have held his dead son after the father said so last June in an NBC News interview. “I lost my son. I buried my son. I held my son with a bullet hole through his head," Heslin said at the time. "They attacked a man who has had to go through what none of us should ever have to go through and they did so knowing what they were saying was false and knowing the danger it could put him in and has put him in and they don't care," Heslin's lawyer Mark Bankston said ahead of the hearing. "Mr. Heslin is not doing well today. It was bad enough, now to be elevated last year to be a major character in this Infowars fantasy wold has really exposed him in a way he wasn’t ready for," he added. 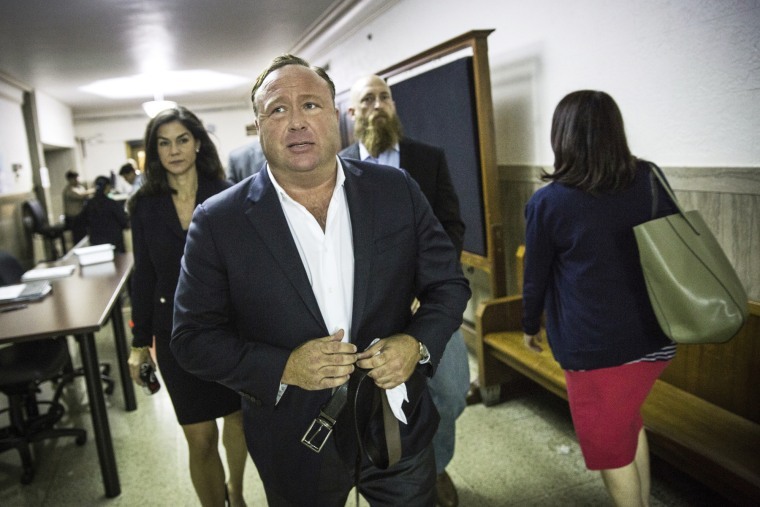 Jones did not attend a hearing on August 1 where his attorney argued to dismiss the suit filed by Pozner’s parents, Veronique De La Rosa and Leonard Pozner. Earlier this month, Heslin and his lawyers accused Jones and Infowars of intentionally destroying evidence relevant to their defamation case by deleting social media posts espousing the false claims that the shooting was a hoax. Jones said during an Infowars broadcast that he had instructed staffers to delete some social media posts in reaction to a news report the previous day that pointed out several posts appeared to violate Twitter's rules. Jones is also facing lawsuits in Connecticut brought by several additional families of victims, as well as a separate suit by a man who was falsely identified on the Infowars website as the shooter who killed 17 people at a high school in Parkland, Florida, on Valentine's Day.